--Unique magnet clasp design, no buckle needed, just easily stick and lock your watch band. --One Size suit for both man and woman size. The magnetic clasp allows you choose the most comfortable size for yourself. 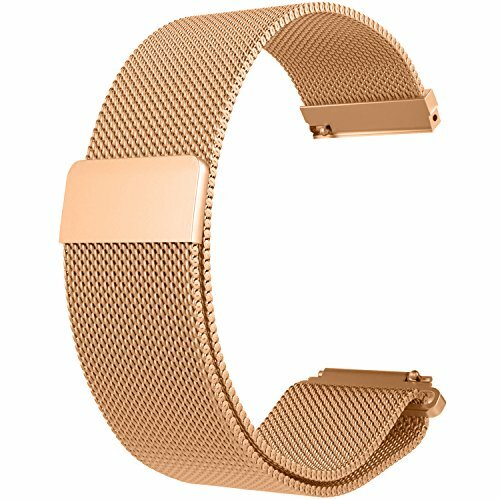 --This bands is made of premium stainless steel metal, the milanese loop mesh watch band is flexible and adjustable, comfortable for day to day wear. 1* Milanese Loop band,18 month Warranty: Unconditionally refund or resend with any quality problems, life-time friendly customer service. Fashionable Designed Milanese Loop strap. Personalized Your smartwatch.Fits all wrists sizes 5.5" - 8.5" fits both men and women to wear.Comfortable and Durable. High-tech surface finish stainless steel watch strap, after 4 precise polishing processes, the surface texture feels exquisite. All watch strap passed pulling force test, professionally made and constructed, quality assured. Unique fully magnetic milanese loop is infinitely adjustable, NO TOOL needed.Durable and lightweight woven stainless steel mesh strap with adjustable Milanese Loop to keep your wrist ventilated and comfortable. Multi colors available in Black, Silver, Gold, Rose Gold, Blue...Various colors to dress up your Watch and highlights your unique taste.also as a fantastic gift for your friends, family and your beloved ones etc. RuenTech takes pride in high quality products and offers life-time friendly customer service.18 month Warranty.Unconditionally refund or resend with any quality problems.